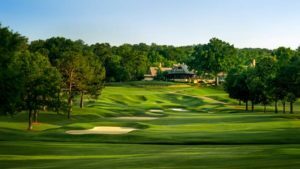 At the USGA men’s state team golf championships, Missouri is in a four-way tie with Ohio, Connecticut and Texas for the lead after the first round from the West Course at the Country Club of Birmingham. Richard Berkmeyer from Wildwood shot a 2-under 69. Brad Nurski of St. Joe par-71 and Sam Migdal from Ballwin a 75. The tournament is being held at the West Course at the Country Club of Birmingham. Missouri’s Richard Berkmeyer shot a 2-under 69. The 42-year-old from Wildwood has also competed on the Donald Ross layout in several other competitions, and used the experience to card four birdies.